Every week, we bring you a must-hear track from the Le Guess Who? 2018 line-up. Last week, we highlighted a classical and timeless hip hop track of Georgia Anne Muldrow. 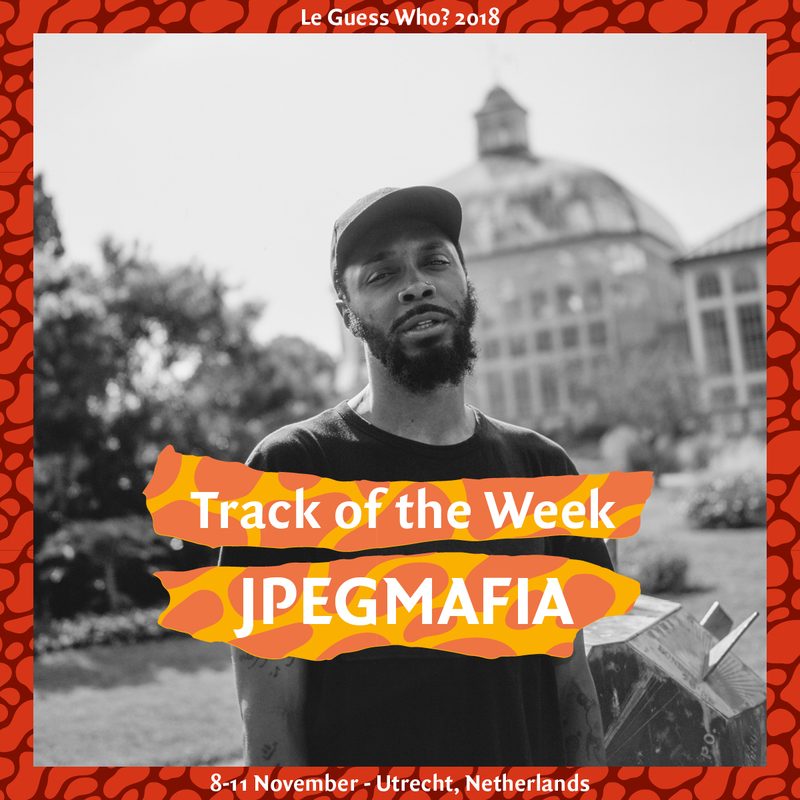 This week, we shift phase and point out a highly contemporary cut of experimental rapper and producer JPEGMAFIA. Opening his latest album 'Veteran' – yes, JPEGMAFIA did serve the U.S. army for several years –, '1539 N. Calvert' feels like a sped up trap song, featuring an odd, quick-paced bass drum and distinctive snare. On this track, Peggy – as he's often referred to – takes on conventional hip-hop and pushes lo-fi rap and trap music to bold new directions. Despite Peggy currently living in L.A., '1539 N. Calvert' is mainly shaped by his former hometown of Baltimore. The song title, which is the address of Baltimore's former art space The Bell Foundry, hints to the shutting down of this safe haven for DIY artists. A gritty, chopped-up piece of noise-rap, '1539 N. Calvert' sees JPEGMAFIA spilling it all out. Damn Peggy, indeed. Update: check out the video for the track below. Want to explore more music? We've collected all our weekly tracks in one playlist; listen via Spotify, Deezer of Apple Music here. JPEGMAFIA will perform at Le Guess Who 2018 together with a.o. LYZZA, Art Ensemble of Chicago, Saul Williams & King Britt, GAIKA, Kelman Duran, RP Boo, FAKA, DJ Noss, Kojey Radical, 700 Bliss, AMMAR 808, and many more.